It was already a few minutes past 2 p.m. The trade deadline had come, and it seemed as though the Bulls were standing pat despite rumored efforts to deal Pau Gasol. I kept scrolling through my Twitter timeline, though. My sports PR class still hadn’t started yet, so I figured I could try and catch whatever last-minute trades were made. But then I saw his name: Kirk Hinrich. I was hoping, praying it wasn’t real, that I was just seeing things. I kept scrolling, though, and there it was again: a tweet from ESPN’s Brian Windhorst with Kirk’s name and the word “traded” in it. I couldn’t believe what I had just read. I didn’t want to believe it, and part of me still wasn’t convinced that this was reality. I just sat in class anxiously, hoping I didn’t have to go through this all over again. But I got a Twitter notification a few minutes later; it was a new tweet from the Chicago Tribune‘s K.C. Johnson. Whenever I want to know what Bulls news to believe, I go to K.C. Johnson because I trust him as a beat writer. So when I saw that his tweet confirmed Brian Windhorst’s tweet about Kirk being traded, my heart officially sank. And, at the same time, it started pounding faster than it had all day long. I could feel the tears building up in my eyes, but I refused to let them fall. I was in class for goodness sake, and it had just started, too. It was real. It was all real. The Bulls traded Kirk (AGAIN), and my heart was breaking all over again. The last time the Bulls traded Kirk was in June 2010 on the day of the NBA draft, and it seems like a lifetime ago. I hadn’t started my sophomore year of high school, and I wasn’t a sports writer—let alone a person who wrote for enjoyment. 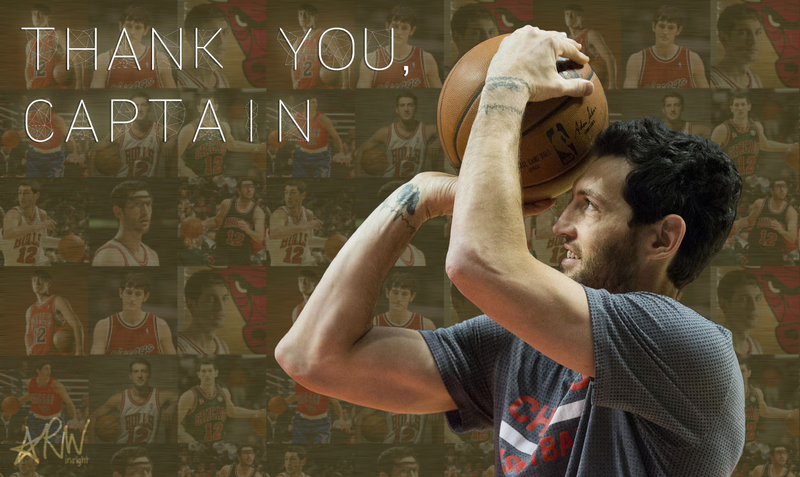 In some ways, I was a much different person back then, but there’s one way in particular where I haven’t changed: my fandom for Kirk Hinrich. I didn’t handle Kirk’s trade well back then either. It was devastating. I didn’t really appreciate what Kirk had done for the Bulls yet, so I took for granted all the times I was able to watch him play. This all came despite the fact Kirk was much more involved in trade rumors back then. But I somehow got through it. Maybe it’s because I didn’t immediately have to deal with the fact Kirk wouldn’t be on the Bulls—it was the offseason, so I wasn’t going to be watching NBA ball anytime soon. I had time to get used to the idea even if it would be months and months until I would actually become accustomed with seeing a Kirk-less Bulls team and a Kirk sporting the Wizards’ then-team colors of blue and gold. It’s the latter half of February, and Kirk’s been back in Chicago for three and a half seasons. I remember Kirk’s second stint as a Bull much better than I remember his first one for a few reasons. One of the main things is I didn’t really get to watch any NBA basketball much as a child, back when Kirk was still in his first stint as a Bull. I was also just a kid who didn’t really take basketball that seriously yet—I loved basketball, but I wasn’t truly passionate about it yet. There’s a difference. Another reason, as aforementioned, was I just didn’t know to appreciate Kirk and all of the times I got to watch him play. It was just fun getting to watch basketball and great knowing I had opportunities to watch him play the sport. But now I remember so much more: the time he hit a left-wing jumper to send the Bulls’ game against the Celtics into overtime, the time on Martin Luther King, Jr. Day two years ago when he outperformed Steve Nash—and crossed him over multiple times—to finish with 22 points and eight assists, the time he buried a clutch right-wing three that forced overtime against the Warriors. I remember so much more now because I’ve become so much more passionate about basketball since the first time Kirk was traded, because that first trade taught me to appreciate all of the times I’ve had the chance to watch him play. Once I realized Kirk’s trade was really happening, it was hard for me to keep it together in class. Because of all that happened, I felt inclined to check my phone every so often to see what everyone else was saying about Kirk and the trade. My phone was quickly flooded with notifications from people asking me about Kirk, apologizing for the fact he was no longer a Bull because they know how much I love Kirk, how much I love that he was playing for my favorite team. It was nice knowing how so many people thought of me when the trade happened. It also makes me feel as though I’ve solidified my status as Kirk’s biggest fan—even if my brother thinks otherwise thanks to one woman’s gigantic Kirk wall art. But that still doesn’t change the fact I couldn’t fully concentrate in class. Somehow, though, I managed to copy down all of the notes and follow the main points of the lecture. I even explained the NBA’s dress code after my professor asked who in class knew about it. But there were also moments when I wasn’t up for participating. There were moments when I just wanted to start crying but had to hold off for now because I didn’t want to have a breakdown during class; that’d just be embarrassing. There were moments where I just spaced out and thought how wrong it was for the Bulls to ship off Kirk after everything they’ve been through—after everything Kirk has done for the organization. I get that basketball is a business, but it still feels wrong. The biggest reason it feels wrong is because I know this is basically the end for Kirk and basketball. Heading into this current season, I was fully aware that this could very well be Kirk’s last season not only as a Bull, but as a professional basketball player. So I was even more inclined to appreciate all of the times Kirk got minutes even when they weren’t always productive. But I never thought that I had potentially watched Kirk play in his last game ever as a Bull last week. And this time, I don’t have that same hope about Kirk playing for the Bulls again. Before, there was always hope that Kirk would come back to the Bulls. The Bulls’ front office loved Kirk and never wanted to get rid of him. Everyone knew they’d reunite. Deep down, I knew it was going to happen, too; I just had to wait around for that time to come. But this time, it feels like it’s over, Kirk’s time in Chicago. It doesn’t feel like he’s coming back, like he’s ever going to sport Bulls red on the hardwood ever again. Some people have questioned, even during Kirk’s first time away from the Bulls, if my favorite team is whichever team Kirk is on. I don’t blame anyone for thinking such a thing, but it sometimes makes me question if I come off more as a Bulls fan or as a Kirk fan. Regardless of that, it was something that came up again after this latest trade. The Bulls are my favorite team: They always have been, and they always will be. Nothing is going to change that. If it wasn’t for the Bulls drafting Kirk, I probably wouldn’t have become a fan of Kirk’s. But I will say Kirk has had just as much of an impact on me falling in love with basketball as the Bulls had. And that’s one of the reasons why I’ve taken this recent trade so hard. I didn’t realize it the first time around, but it was a collective effort between the Bulls and Kirk that made me become so passionate about the one sport I could never live without: It remained as such even when Kirk was away from Chicago—I watched Kirk’s games whenever I could on non-Bulls gamedays. It’s that same collective effort that keeps my passion for basketball going, but for the past three and a half seasons, that effort was as collective as it could be considering Kirk was a Bull. I knew it couldn’t be that way forever, but it has happened sooner than I expected. When I came back to my apartment, I headed straight to my room and cried. Could I have held back the tears? Absolutely. Did I want to do that? No, I had already done that, and I’ve learned it’s unhealthy to hide your feelings. I don’t know how long I just lay on my bed with dried tears irritating my face, but it was at least 10 minutes, and I just wanted to stay there for the rest of the day. I had other responsibilities, though, so I got up. But, throughout the remainder of the day, I saw photos, watched videos, and read articles that all made me want to start crying again. I never thought anyone would want to trade for Kirk during his second stint simply because he just wasn’t a valuable trade asset this far into his career, so seeing all of these things, reading words about his second departure just reminded me I was wrong, that he’s not a Bull anymore. It made me reminiscent of my being a Kirk fan, and that’s something I’ll always be: a Kirk fan. Kirk may not be my favorite Bull anymore, but he’ll always be my absolute favorite basketball player. And Kirk may not be in Chicago anymore, but it’s where he grew up as a professional basketball player, where he made a name for himself. Chicago is where he made history: third in games played, assists, and steals; fourth in minutes played; eighth in field goals made and total points; first in made three-pointers. Maybe he won’t get to retire as a Bull and have that storybook ending to his career, retiring as a member of the team that drafted him. Nice post, I have watch Kirk play since he was in college at Kansas playing with nick collision. Kirk going to the Bulls just made it so much better knowing he was playing for the Bulls. Love the Bulls. Kirk is one of a kind type of player and he’s special in his own way and style appreciate your post and I was hoping Kirk was going to get to retire in Chicago but still he had an amazing career. I know I am going to miss Kirk on the Bulls. It will never be the same. Kirk all time favourite player. Love watching that guy play ball. Thank you! I always enjoy hearing from fellow Kirk fans!